The aim of PO.EX: A Digital Archive of Portuguese Experimental Literature (http://po-ex.net/) is to represent the intermedia and performative textuality of a large corpus of experimental works and practices in an electronic database, including some early instances of digital literature. This article describes the multimodal editing of experimental works in terms of a hypertext rationale, and then demonstrates the performative nature of the remediation, emulation, and recreation involved in digital transcoding and archiving. Preservation, classification, and networked distribution of artifacts are discussed as representational problems within the current algorithmic and database aesthetics in knowledge production. The performative dimension of experimental literature challenges our archival practices in ways that draw attention to the performative nature of digital archiving itself. Decisions about standards for digital encoding, metadata fields, database model, and querying methods impose their particular ontologies and structures to collections of heterogenous objects derived from historical practices that emphasized the eventive nature of signification as an interactive process of production. Instead of a transparent remediation of an original autograph object in its digital surrogate – a visual effect of the digital facsimile experience that is frequent in scholarly archives – multiplicity of media and versions, as well as the programmatic focus on live performance as poetic action, call for a self-conscious engagement with the differentials of inscription technologies and, ultimately, with the strangeness of digital codes as an expression of the performativity of the archive. The PO.EX project provided both a context for this heightened awareness of digital archiving as an act of transcoding, and an environment for experimenting with forms of archiving that attempted to respond to that self-consciousness about archival intervention. This article contains an overview of the project and offers an account of how the PO.EX Archive has wrestled to address the difficult theoretical questions raised by the progress of our research. The name “PO.EX” contains the first syllables of the words “POesia EXperimental” and it has been used as a general acronym for those and subsequent experimental practices since the first retrospective exhibition of the movement, which was held at the National Gallery of Art, Lisbon, in 1980. A second major retrospective was organized by the Serralves Museum of Contemporary Art, Porto, in 1999. The PO.EX project involved a multidisciplinary team of 13 researchers, with expertise in literary studies, communication and information sciences, contemporary art, and computer science. At various stages, the project also benefited from the collaboration of 6 research assistants. A significant part of the work consisted of locating sources, digitizing, and classifying them. The PO.EX Digital Archive holds c. 5000 items in multiple formats (text, image, audio, and video files) and is scheduled for online publication at the end of 2013. The recently finished second stage of the project ( PO.EX ’70-80 , under development 2010-2013) digitized works from the 1970s and 1980s. It was preceded by an earlier project ( PO.EX ’60 , under development 2005-2008) that digitized works from the 1960s, namely the magazines and exhibition catalogues of the Experimental Poetry movement. The result of the first stage was published in 2008 both as a web site and a CD-ROM. In its present instantiation PO.EX will be published as an open repository using DSpace. Portuguese experimental literature of the 1960s, 1970s, and 1980s includes visual poetry, sound poetry, video-poetry, performance poetry, computer poetry, and several other forms of experimental writing. Experimental literary objects, practices, and events often consist of an interaction between notational forms on paper (or other forms of media inscription) and site-specific live performances. In experimental practices, the eventuality of literary meaning is dramatically foregrounded by turning the text into a script for an act whose performance co-constitutes the work. Such performative practices are poorly documented and yet they may exist in several media and in multiple versions. Multiplication of versions across media is another aspect of the laboratorial dimension of experimental aesthetics: a visual poem may have a version for gallery exhibition, and another for a book collection; its live reading may have been sound recorded or it may have become a script for a film or computer animation. Fragility and ephemerality of materials also characterize works that may have been produced in very small editions or in a single exhibition version. 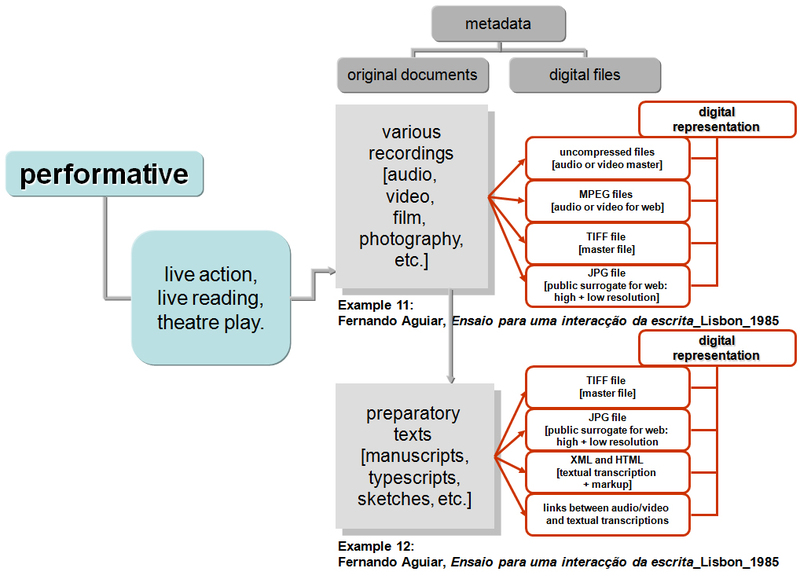 The aim of PO.EX: A Digital Archive of Portuguese Experimental Literatutre is to represent this intermedia and procedural textuality in a relational database and to explore the research and communicative potential of this new archival space. The multimedia affordances of hypermedia textuality seem particularly adequate for representing those intermedia and performative dimensions of literary practices, and also for preserving the ephemeral nature of inscriptional traces that have taken multiple forms, including paper and book formats, video and sound recordings, live performances and public installations, computer codes and screen displays. The aggregation, structuring, and marking up of digital surrogates of this large multimodal corpus have interpretative implications that challenge our representations of experimental works and practices, and our database imagination for digital possibilities. Whether taking the form of facsimiles of books, photographs of installations, sound recordings of readings, videos of performances, or emulations of early digital poems, digital remediation re-performs the works for the current techno-social context. Editing intermedia texts for a digital environment forces us to address a number of specific questions related to documents, methods, contexts, and uses. 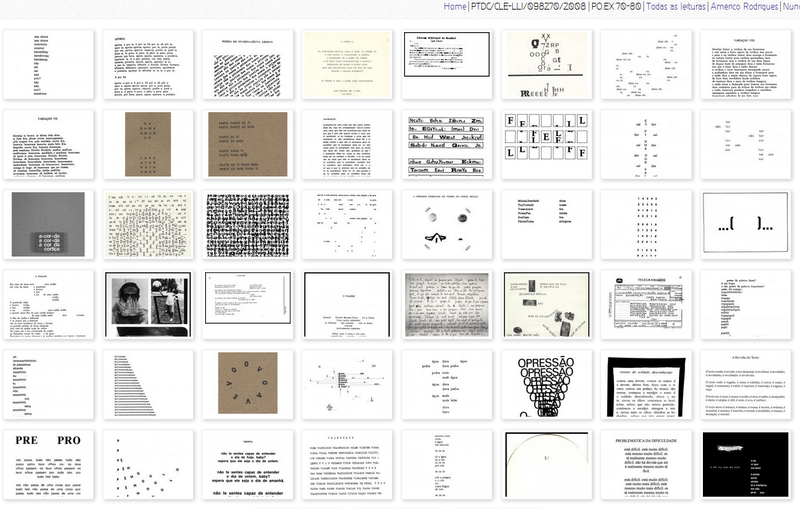 The materials included in the PO.EX Digital Archive are, in many ways, similar to those we may find in archives such as UbuWeb , particularly in its early versions, which were focused on visual, concrete, and sound poetry. UbuWeb , however, has grown as an open and decentered hypertext without explicit editing principles or scholarly methodology that would control the metadata about original sources and their digital remediations. Its emphasis falls on collaborative non-institutional construction and on a rationale of open access that uses the networked reproduction and distribution of files to provide global access to digital versions of rare materials in multiple media (print, sound, video, film, radio) that often exist only in limited copies or in inaccessible archives. Digital republication, by itself, contributes to a redefinition of the cultural and social history of creative practices, since many of these experimentations and communities of practice were generally absent from institutional print-based narratives of artistic and literary invention. UbuWeb ’s inclusive approach has created a vast repository of art practices, media, genres, and periods. This approach has produced a new context for understanding the nature and history of experimental forms in English (and, to a much lesser extent, in a few other languages and cultures) simply as a result of their hypertextual contiguity and networked availability. A similar effect may result from the PO.EX project: the mere aggregation of dispersed works and textual witnesses in various media – some of which were unaware of each other and entirely absent from mainstream accounts of contemporary literature and contemporary art – will produce a new perception of Portuguese experimental literature both for inside and outside observers. The following section briefly sketches some of the questions raised by the PO.EX Digital Archive , and describes its infrastructure and content. Given that a significant part of the materials are rare, and in some cases exist only in a single instance, one of the declared aims of the PO.EX project is to collect and preserve our artistic and cultural heritage through digital remediation. This is especially true of (1) visual texts, collages and other ephemeral works of which there is only the original object, (2) sound and video recordings that have never been published or distributed before, and (3) computer works that cannot be run in current digital environments (see Torres 2010). A survey of published and unpublished materials housed in public and private collections, and sometimes in the writers’ archives, revealed the existence of a large body of work in multiple media. Three features are common to PO.EX authors: openness to experimentation in different technological media (such as printing techniques, audiotape, film, video, and computers); willingness to participate in the public sphere and engage in social and political debates (producing works for television, for instance, or works of public art); and a general inter-art sensibility that places verbal language in an intermedia tension with visual art, video art, installation, performance, theatre, and music. Representing the polymedia and polytextual dynamics of these works – within a network that includes, in some cases, preparatory documents and multiple versions, and also authorial and non-authorial critical texts – became the main theoretical and technical challenge of the project. Planographic, three-dimensional, phonographic, videographic, digital, and performative materialities. The structuring of works into six material clusters privileged technologies of inscription of the original objects and also the visual, sound, spatial, and participatory modes of experiencing them. Our analysis and description of the collected materials recognized six types of materialities that were to be digitally represented in the archive: planographic, three-dimensional, phonographic, videographic, digital, and performative [see Figure 1]. Materiality, a category that subsumes the artistic medium and production techniques of the originals, was also conceived in terms of a differential relation to the code-based medium of digital reinscription with its screen-based interface for perceptual experience. Thus the mode of original technical inscription and of its particular perceptual experience, rather than the artistic discipline or genre, became the basis for categorizing the work’s materiality. For each item a digital surrogate would be generated through specific encoding procedures and formats, and its metadata would contain fields describing the original objects as well as fields describing the surrogates. 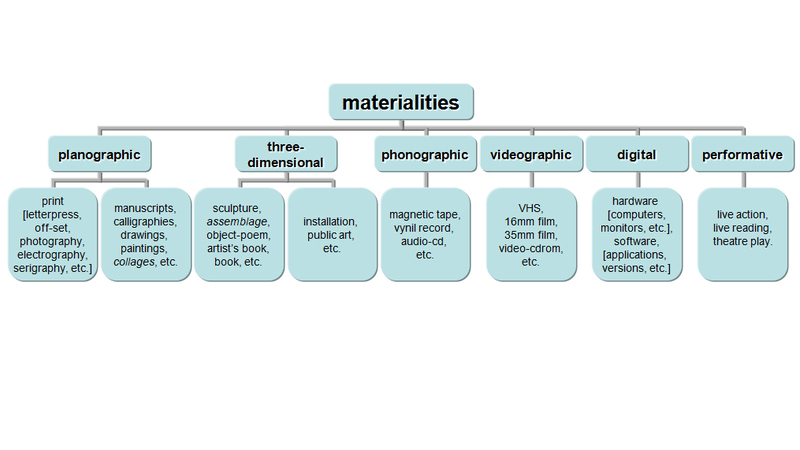 The following diagrams explain the remediating dynamics for different kinds of objects: printed pages of text, including visual poems [see Figure 2], artists’ books and public art [see Figure 3], audiotaped sound poems [see Figure 4], video works [see Figure 5], early computer works [see Figure 6], and performance-based practices [see Figure 7]. Two examples are given for each type of remediation. Planographic materialities. Manual and printed planographic inscriptions are remediated through textual transcription and/or digital images. Three-dimensional materialities. Three-dimensional works are remediated through image and video files.Additional planographic inscriptions are remediated through textual transcription and/or digital images. Phonographic materialities. Analog sound recordings are remediated by digital audio formats. Additional planographic documentation is remediated through textual transcription and/or digital images. Videographic materialities. Analog video works are remediated by digital video formats. Additional planographic documentation is remediated through textual transcription and/or digital images. Digital materialities. Computer works are remediated through emulations and/or recreations in current scripts and formats. Additional planographic documentation is remediated through textual transcription and/or digital images. Performative materialities. Depending on the material nature of existing documentation, performance works will be remediated according to one or more of the following material translations: planographic, phonographic or videographic. The multiple material and textual mediations in a digital archive of multimodal works can be illustrated with “Soneto Ecológico” [“Ecological Sonnet”] (1985, 2005), by Fernando Aguiar. 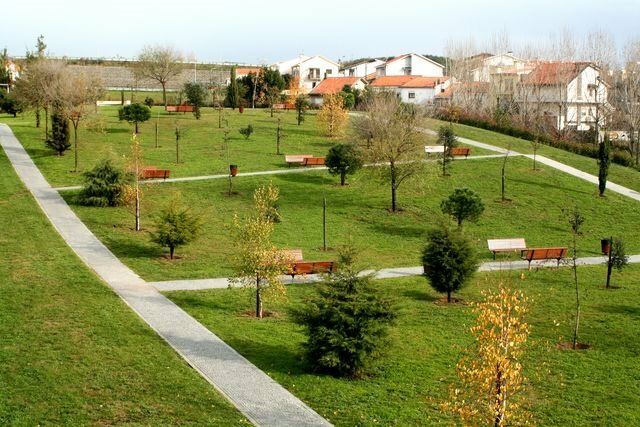 This work is a public park in which seventy trees of ten different species (autochthonous from Western Iberia) have been planted according to line and rhyme patterns of Portuguese classical sonnets (14 lines, abab cdcd efe fef). The work was originally created as three-dimensional model and blueprint for the park, and was exhibited several times in this form. Twenty years after its first presentation, the projected park was finally created in the town of Matosinhos [see Figure 8]. Digital representation of this work in the archive is achieved by means of a network of files: photographs of the original 3D model, digitized images of textual descriptions, plans and diagrams, as well as photographs and videos of the actual park. These are further complemented with an interview of the author, and several reception documents. The archive will thus generate three contexts for reading this work: the context of its own textual and material history; the context of parodies of the sonnet form in the PO.EX movement; and the context of ecological awareness in national policies for forestation and protection of local tree species. Fernando Aguiar, Soneto Ecológico (1985, 2005). © Photograph by Fernando Aguiar, 2008. Remediation of this multimodal corpus raises two clusters of theoretical and technical problems. The first cluster of problems originates at the level of the source materials for the archive, such as selecting from the source materials those documentary evidences (in multiple media) that will come to represent a given body of works and, in some cases, live performances of works. Selected works and documents can be transcoded according to several technical protocols. Digital representation of the source objects generally follows a hypertext rationale, as established and formalized by scholarly electronic editions of literary and artistic works published since the mid-1990s. This means producing digital facsimiles and transcriptions, marking up variations and versions, and creating elaborate metadata both about the digital surrogates and their source objects. The second cluster of problems derives from issues posed by the new archival medium. We need to work with a model of electronic space that takes full advantage of its processing, aggregative, and collaborative functionalities as a new space for using the archived materials in new contexts, including teaching, research, and other creative practices. In this section, I discuss issues of remediation related to print, audio, and born-digital artifacts, and I will place the archive within theoretical frameworks useful for thinking about editorial questions raised by the multimodal and experimental nature of its content. Every material instantiation is a new textual instantiation that can be represented as an item in a database of electronic files. Peter L. Shillingsburg sums up this view of the material incommensurability of each textual instantiation through the concept of “script acts” as networks of genetic and social documents: “By script acts I do not mean just those acts involved in writing or creating scripts; I mean every sort of act conducted in relation to written and printed texts, including every act of reproduction and every act of reading.” [Shillingsburg 2006, 40]. Once encoded and marked-up as electronic texts, past textual iterations are reiterated as machine-processable forms. The “hypertext rationale” implies digitizing and structuring materials in ways that give a meta-representational function to the process of de-centering and re-constellating their textual modularities in digital formats. Texts are not just pluralized in their various authorial and editorial forms but they are also re-networked within large ensembles of production and reception documents. Hypertext became a research tool for understanding the multidimensional dynamics of text, and for testing social editing as theory of textuality. In the electronic medium, the scholarly edition is reconfigured as an archive that attempts to make explicit the editorial frames that have produced each textual instance in its past bibliographic materiality. Self-awareness of textual transmission and intertextual dependence, coupled to a hypertext rationale for electronic editing, resulted in a general movement away from the discrete book-like digital edition to a radial and fragmented all-inclusive archive. The representation of texts and images as a networked, aggregated and socialized archive is also a way of testing a theoretical approach by exploring specific features of the electronic writing and reading space. Johanna Drucker has eloquently argued for the importance of modeling the functionality of e-space in ways that reflect a thorough understanding of the dynamics of book structures, but also in ways that go beyond the structures of the codex and take full advantage of programmable networked media. She highlights the following affordances of digital materiality: continuous reconfiguration of digital artifacts at the level of code, the capacity to mark those reconfigurations, the aggregation of documents and data in integrated environments, and the creation of spaces for collaboration and intersubjective exchange [Drucker 2009, 173]. 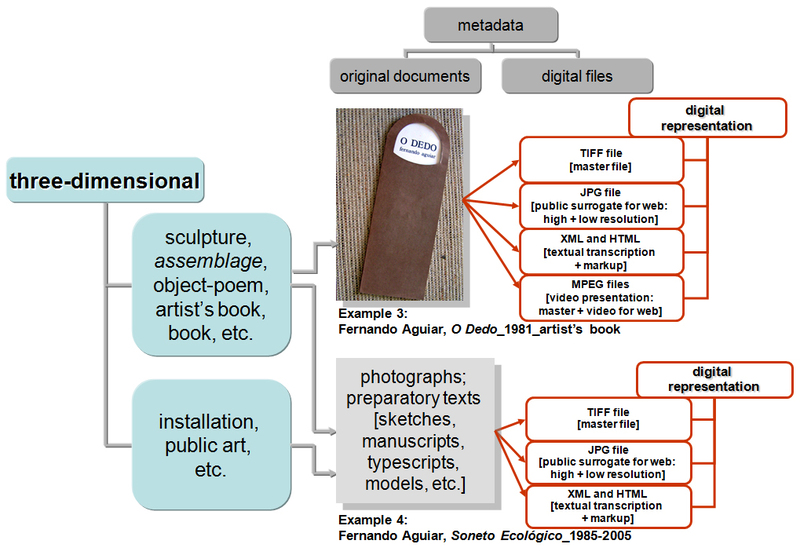 Designing a digital archive depends on the best possible articulation between re/presenting and remediating the materials and inscribing that remediated representation in the specifics of the database ontology and algorithmic functionalities of networked digital materiality [see Figure 9]. Screenshot of an alphabetized display of file titles by António Aragão. When placed in alphabetic order new patterns of relations between graphic surfaces emerge. Released from the specific modularity of codex structures, graphic surfaces can be retrieved and navigated according to a hypertext rationale defined by database structure and search algorithms. © PO.EX Archive, 2013. It must be free and downloadable. A de-centered downloadable audiotext archive would encourage a renewed aural perception of poetry, which could then be released from its grammacentric frame of perception. Bernstein wants the sound archive to foster live encounters with audiotexts perceived as literary experiences and not merely as a collection of historical documents. Networked distribution of artistic and cultural forms has transformative implications for our politics of cultural transmission. Screenshot of the PO.EX interface for a section of the archive containing audio-recordings of visual texts. © PO.EX Archive, 2013. The PO.EX Digital Archive includes a series of sound and video recorded readings that highlight the presence of audiotextuality and performativity as an intrinsic layer of textual practices Figure 10. These readings were commissioned specifically for inclusion in the archive, and they are part of a critical intervention in the presentation of the materials that explores remediation as an opportunity for creative appropriations beyond the mere phonographic archaeological reconstitution. This particular mode of presentation follows an audiotext rationale that offers users non-hierarchical access to multiple pairs of visual text and audio clips. In several instances, recordings contain performances of visual texts that have never been read aloud before. Vocalization of their visual patterns opens up their notational strategies to new sound appropriations. The audio is producing the visual anew and cannot be perceived as a mere record from the past. The documentary function of the digital facsimile as a surrogate of a printed visual poem has been displaced by a reading intervention that calls attention to itself and to the archive as a performance space. A third set of problems originates in the republication of early digital works for which it is no longer possible to reconstitute the original hardware and software environment. Information and library science protocols and standards for the preservation of digital information have been defined, and various institutional initiatives have addressed specific problems posed by digital media artworks. Matthew G. Kirshenbaum and others [Kirschenbaum 2009a] [Kirschenbaum 2009b] have developed the concept of “computers as complete environments” in the context of preserving writer’s archives that contain born-digital artifacts. They argue for the evidentiary value of hardware and storage media, the importance of imaging hard drives and other disk media, the use of forensic recovery techniques, and documenting the original physical settings in which the writer’s computers were used [Kirschenbaum 2009b, 111, 112]. The Electronic Literature Organization started a directory and repository of electronic literature in 1999, and its “Preservation, Archiving, and Dissemination” (PAD) initiative produced two significant reports outlining strategies for preserving present and past forms of electronic literature [Montfort 2004]; [Liu 2005]. The 2004 report by Montfort and Wardrip-Fruin makes a set of recommendations for keeping electronic literature alive, that is, readable and accessible. The authors describe four strategies for the preservation of digital information: “ 1) Old Hardware Is Preserved to Run Old Systems; 2) Old Programs Are Emulated or Interpreted on New Hardware; 3) Old Programs and Media Are Migrated to New Systems; 4) Systems Are Documented Along with Instructions for Recreating Them”. They further summarize their ideas in 13 principles for long-lasting electronic literature [Montfort 2004]. Early works were often poorly documented and authors were generally not concerned whether their programs and texts survived technological changes, making recovery and reconstruction a difficult task. 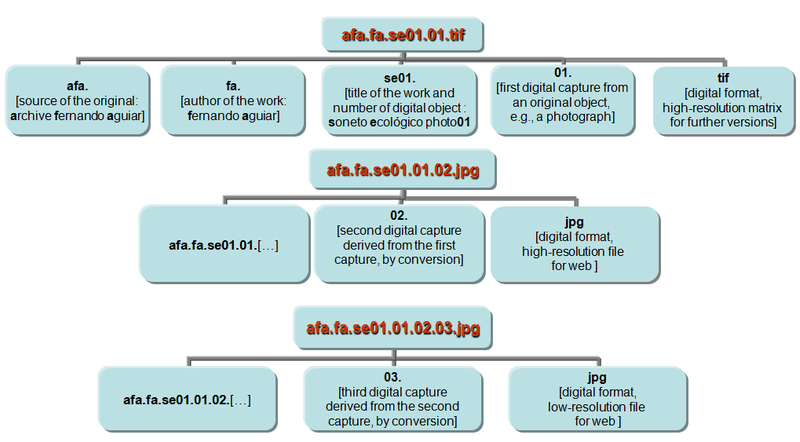 The PO.EX Digital Archive contains examples of computer works by three pioneers of digital literature: Pedro Barbosa, Silvestre Pestana, and E.M. de Melo e Castro. In most cases, the possibility of reconstructing the code for their early works is limited by lack of specific documentation. In the case of Pedro Barbosa our archive includes handwritten notes and diagrams describing iterations and transformations, and also printed outputs of generative texts from mid to late 1970s. Melo e Castro produced a series of animated poems between 1986 and 1989 in collaboration with the Open University in Lisbon, but they were recorded as VHS videos, and little technical information exists about the specifics of software and hardware used for generating and animating those texts. In both cases, any code recovery would have to work back from the effects observed in the printed output, in one case, or in the videos, in the other, and try to infer the codes and processes for the observable visual and textual operations. Recovery would imply some kind of interpretive emulation that translates paper output or video output back into some form of input code compatible with current systems, or perhaps some kind of media archaeology approach capable of identifying their original machines and rewriting their programs. In these two cases, users of the archive will be able to see facsimiles of the original handwritten notes and punched tapes as well as the videopoems, but the texts will not be generated or animated by code. The work of artist Silvestre Pestana provides another example of how PO.EX has addressed the problems of migrating born-digital work. Computer poetry is the title of a series of poems he produced in 1981 [see Figure 11]. At the time, Pestana purchased a Spectrum personal computer with which he made the first three versions of his monochrome visual computer poetry: the first is dedicated to E. M. de Melo e Castro, the second to Henri Chopin, and the third to Julian Beck. Despite being the only instance of such work in Portugal in 1981 (Pedro Barbosa, active since 1975, was working mainly with text generation), this work of dynamic and generative visual poetry still offers important clues for understanding the evolution of computer-animated visual poetry and its relation to the printed visual poetry of the experimental poets. The work was never published. Its code (with some errors recently identified and corrected by the author) was published in the book Poemografias , an anthology of visual poetry co-edited by Pestana [Aguiar 1985, 214, 215, 216]. In this case, Pestana’s early “Computer Poems” can be emulated for the current networked environment, since the community of Spectrum users has made available code forms that run in a Java environment. Although unable to recover the material environment of its original execution, this migration resulted in a version that approximates the functionality of the original. Silvestre Pestana, Computer Poetry (1981; screenshot from the emulated version, 2010). © Silvestre Pestana 1981, and PO.EX Archive, 2013. Shillingsburg has formalized a working model for electronic scholarly editions [Shillingsburg 1996] and [Shillingsburg 2006]. Based on his observation of the achievements and shortcomings of editions and archives developed during the first two decades of electronic scholarly editing, Shillingsburg proposed four sets of questions that must be answered by the infrastructure and functionalities of the edition or archive [Shillingsburg 2006, 92, 93]. The first group of questions concerns the relations between different documentary states of the text and how these relations are made visible for readers. The second set deals with methodological issues about how editorial interventions are made clear. The third group addresses the ways in which a context for the primary texts is produced in the archive through both autograph and allograph materials. Finally, the fourth set of questions details the uses of the edition or archive, including interactions such as making personal collections and annotations on the materials. Although some of those questions may be more relevant for historical materials for which there are multiple print and handwritten witnesses, most of them can be applied to a project devoted to contemporary experimental literature. Contemporary practices take place in a multimedia environment in which versions are also a function of their multiple media inscriptions and not necessarily from later transmission or remediation processes. Because of their programmatic emphasis on process and performance, experimental practices tend to generate multiple textual instances of any given work: a sound poem, for instance, will often have one or several written notations (a performance manuscript or typescript, sometimes a published version), and one or more sound or video recordings of live performances. This combination of ephemerality and multiplicity, of scarcity and abundance, poses challenges for any editing and archival project of late 20th-century experimental literature in a digital environment that are similar to problems raised by documentary and critical editing of historical material of earlier periods. Electronic infrastructure for script acts (model adapted from [Shillingsburg 2006, 101, 102]). By means of the concept of electronic edition or archive as “knowledge site”, Shillingsburg has tried to capture a set of textual, contextual, interpretive, and interactive features that any literary edition or archive must provide for current and future users. These features imply a synthesis between documentary and critical edition that takes advantage of the affordances of the medium. We could say that his model, based on electronic editing projects developed in the 1990s and early 2000s, is an attempt to invent the digital medium for editing purposes. Shillingsburg has structured his “electronic infrastrutcture for script acts” into four levels: textual foundations; contexts and progressions; interpretive interactions; and user enhancements [see Figure 12]. 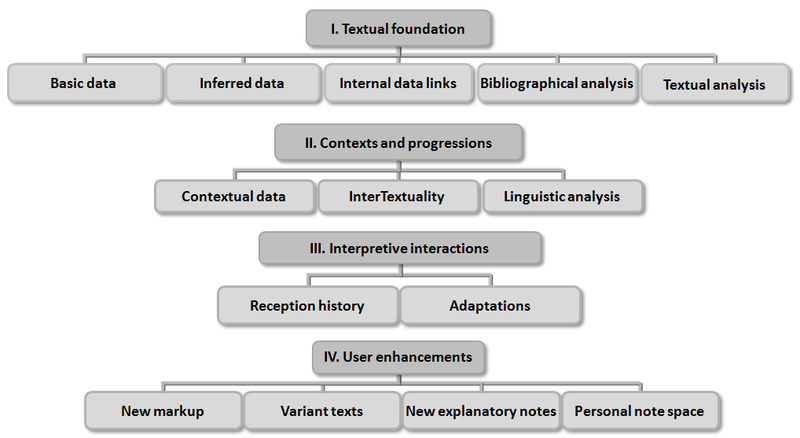 “Textual foundations” refers to basic data, inferred data, internal data links, bibliographic analysis, and textual analysis; “contexts and progressions” includes contextualized data (for each stage of textual existence), intertextuality, and linguistic analysis; “interpretive interactions” refers to reception history and adaptations; and “user enhancements” considers the possibility of users adding new markup, creating new variant texts, and writing commentary and explanatory and personal notes [Shillingsburg 2006, 101, 102]. Shillingsburg’s model for electronic editing helped us to make explicit our options for document selection and for digital representation, including database structure, bibliographic and semantic metadata, and interface form. Despite its critical and theoretical sophistication, this model is still insufficient for the specific nature of this project. On the one hand, textual, methodological, and contextual principles need to be adapted to the multimedia textuality of this particular corpus of experimental literature; on the other hand, we want to experiment with creative possibilities for digital remediation of the collected materials. Theoretical and technical issues triggered by ongoing research also impact on the possible uses of the archive. Especially important in this regard, are the social and academic uses that we want and expect this archive to support and encourage. The gathering of rare, disperse, and often inaccessible materials, and the creation of a user-friendly interface to a relational multimedia database should be equally productive for general online reading/viewing/listening practices (including access through mobile devices) and for specialized teaching and research purposes. Although the computational implementation of all aspects identified by Shillingsburg is more complex, time consuming, and costly than what we could hope to accomplish in a three-year project, we tried to explore them at least in their theoretical implications. The aim would be for this archive to fruitfully combine the preservation, repositorial, and dissemination functions, with the creation of a research resource capable of generating new knowledge in the future. This seems to be the best way to maximize the simulation and interactive capabilities of digital environments and digital tools as knowledge sites. Even if we had to limit the structure and functionality of the archive to what was computationally feasible within our resources, we have tried to think through the electronic infrastructure of PO.EX Digital Archive with our best theoretical and technical imagination. As a multimodal archive of experimental literature it should be both an aggregate of digital surrogates of various media works (and related documentation) and an investigation into the possibilities of digital representation and database structure that creatively explores the materiality of the medium and of its codes. The possibility of creating a fluid environment – open to addition and restructuring as a result of ongoing and future critical interactions between users and objects – is one example of the kind of remodeling and progressive categorization inherent in the flexibility of digital representation as reconfigurable and self-documenting data. Reconceived as a remediated critical environment, the digital archive should be able to sustain and encourage reflexive feedbacks between textual representation, contextual simulation, and interpretative interaction [see Figure 13]. Three functions for the digital archive as remediated critical environment: textual representation, contextual simulation, and interpretative interaction. Current modes of knowledge production participate in the general database aesthetics of digital culture. Situated between information science protocols and digital humanities research projects, “digital archives” have become the current historical form of an institutional desire for structured, aggregated, displayable, and manipulable representations. If archival meaning is codetermined in advance by the structure that archives, the order of the archive – its politics of representation – coproduces the writings and readings by means of specific preservation and presentation strategies. Inclusion and exclusion, as well as the conceptual and interpretative apparatus expressed in structure and interaction design, frame the archive also (1) as an archive of its own editorial theory, (2) as an instantiation of its technological affordances and institutional settings, and (3) as a program for perception and use. 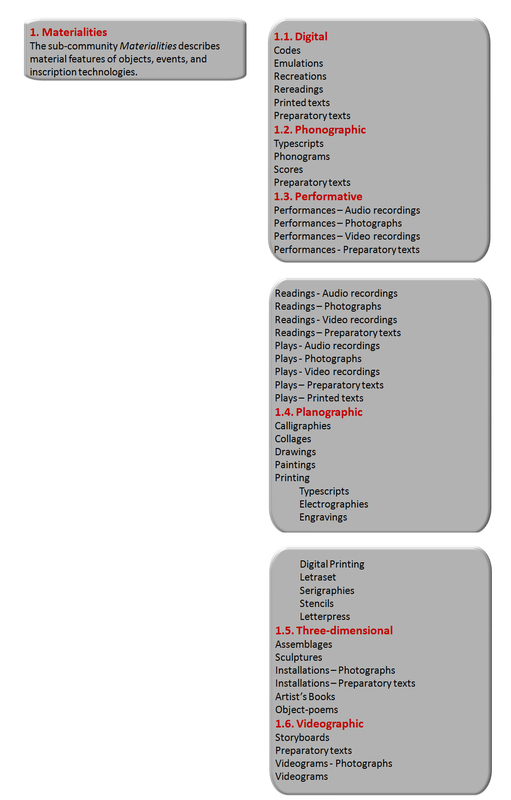 The following sections describe the digital archive as a performance of its contents. Performative transcodification in the PO.EX Archive can be seen in digitization and metadata, on the one hand, and in the recreation of works, on the other. We can distinguish three levels of performativity in digital archiving, each of them involving one cluster of problems: (1) the first level relates to problems of digital representation such as selection of objects, digitization protocols, and file formatting – the archive performs the relation of digital surrogates or versions to their originals through the remediation of a plurality of materials; (2) the second level relates to problems of organization and retrieval of digital objects, including database structure, document modeling, and metadata – at this level, the archive performs the relations of digital objects to themselves and to each other, according to category-building processes; (3) the third level relates to problems of functionality and interaction design, such as search algorithms, display, and web interface – the archive performs the relations of digital objects to subjects as users and readers [see Figure 14]. 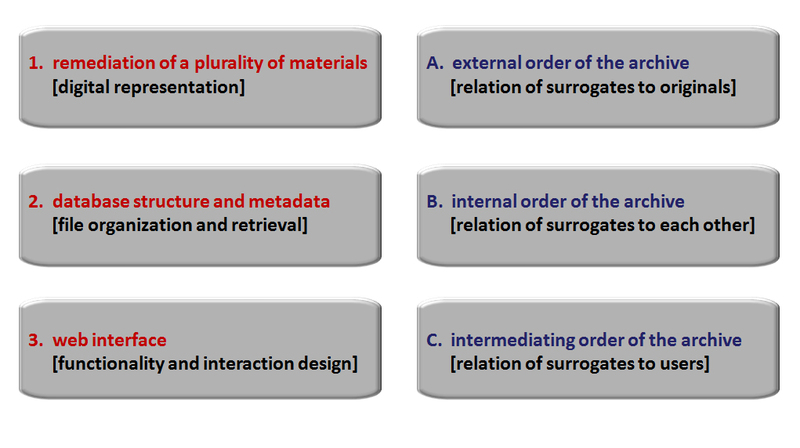 Three layers of relations in digital archiving: (1) materials remediated in the archive refer back to an external order, i.e., digital representations express relations of surrogates to originals; (2) through database structure and metadata, surrogates are placed in relation to each other, i.e., they establish an internal order; (3) functionality and interaction design embodied in the interface establish a program of relations of surrogates to users, i.e., they create an intermediating dynamics between the affordances and constraints of the archive and its actual uses. 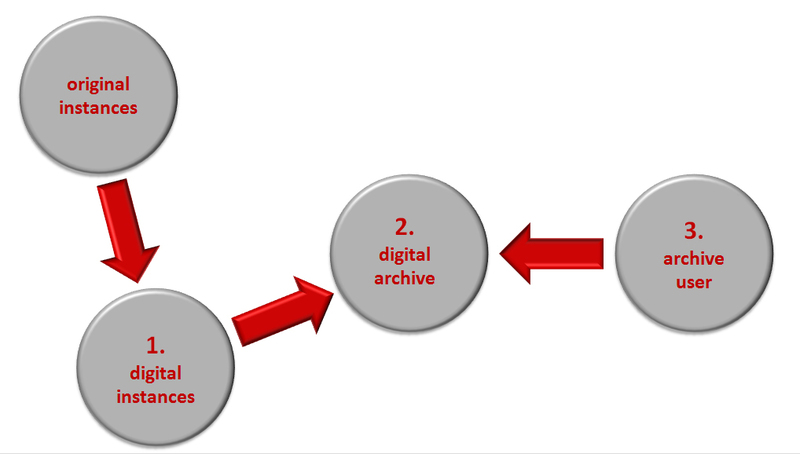 Digital archiving as intermediation: the digital archive (2) functions as a programmed intermediation between users (3) and its own digital instantiations (1) of remediated materials. 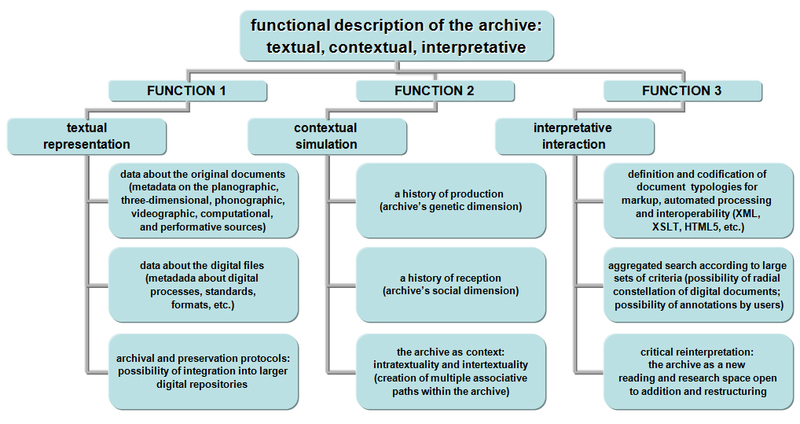 When these three levels are fully articulated, we can say that the archive functions as an instance of intermediation between prior material and media forms and their digital remediation, on the one hand, and also as an instance of intermediation between those digital representations and certain practices of reading and use, on the other [see Figure 15]. 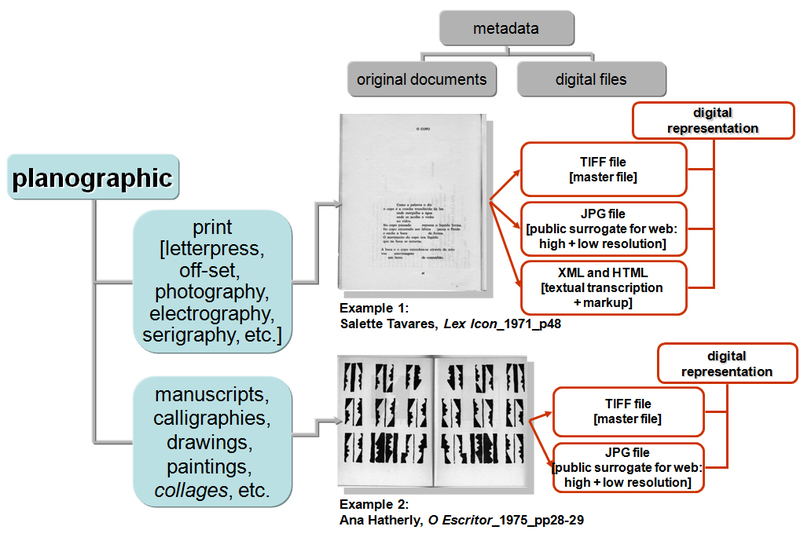 Considered in its digitally mediated condition, the archive (a) models handwritten, print, audio, video, and digital documents through specific data formats and markup, (b) makes them searchable and retrievable through algorithmic processes, (c) displays them as a network of navigable related items, and (d) aggregates them in a collaborative space for further analysis and manipulation. Through those functions, the archive expresses the database aesthetics of digital culture, and engages the encyclopedic, procedural, spatial, and participatory affordances of the medium, as described by Janet Murray [Murray 2012, 51–80]. Digital archiving as representational tension: analysis and description of material and textual features of the originals (A1, A2) will determine choices concerning digital remediation in terms of both format and metadata (B1, B2). The order of the archive is based on this representational tension between some sort of agreed material and textual correspondence to an external order (A) and the reconfigurative difference of its processibility and medium-specific internal order (B). 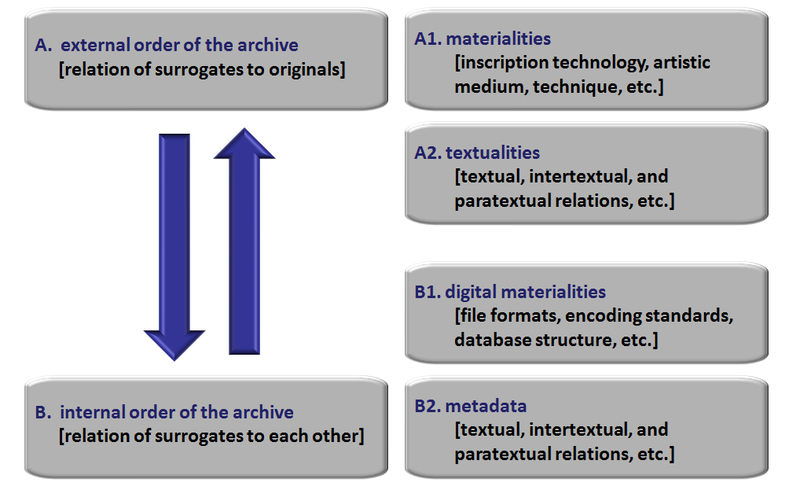 Digital archiving as translation: material and textual relations in the originals (A1, A2) are translated into material and textual relations in the surrogates (B1, B2). Translation takes place at the material level of transcoding (adoption of specific digital standards and formats for generating text, image, audio, and video files, including transcoding between earlier and current digital formats) and at the metadata level of textual description and classification. The archive order is a multilayered documentary and critical simulation of external relations mediated by its own internal structures and forms. Another way of understanding the material and textual performativity inherent in digital archiving is to think of the digital archive as a process of translation [See Figures 16 and 17]. The transcoding of objects in digital format is based on an assessment of material and textual features of the source objects and on decisions about the best way to represent those features in digitized form – facsimile images, textual transcriptions, standards for audio and video encoding, transcoding between digital formats. Remediation creates object-to-object correspondences across media, while submitting the surrogates to constraints and affordances of the new medium, such as modularity and processibility. Material and textual relations are reconstituted within the archival order also as a network of interrelations whose internal order is in tension with an external order. 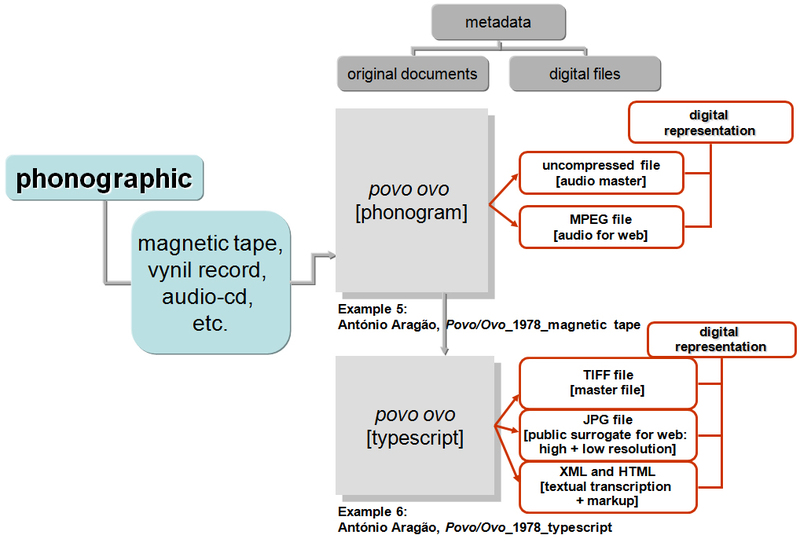 This process of media translation can be illustrated with the naming system for files in the archive [see Figure 18]. The creation of a digital archive implies the cumulative production of a large quantity of files that maintain a network of relationships among themselves and between them and their sources. Descriptive metadata (that identify the contents and technical data of the file) and administrative metadata (that identify creators and editors of the file) enable producers and users to assess the authenticity, integrity, and quality of the data. In addition to this self-description associated with each file, it is also important that the overall organization of the archive and of the adopted remediation methodology are reflected in the directory structure and naming conventions of files, which should become clear, in the first place, for all project participants, and also for users. These conventions should allow not only a clear understanding of relations between files that derive from each other, but also their relationship with the objects, collections, and repositories of origin. Naming conventions should also allow the continuous addition of new elements within their scheme of hierarchies and associations (see [Pitti 2004]). Correspondences between external and internal orders of the archive as reflected in the file-naming system: the first sequence of initial letters preceding the dot serves to identify the archival source of the original document from which digital versions were obtained. The second sequence of letters is used to identify the author of the work (in the case of works with multiple authorship, authors’ identifiers are separated by dots). The third letter sequence contains the initials of the work’s title (followed by a number if there is more than one digital representation of the same work). Sequences of digits that follow the letters identify the relative order of derivation of digital objects when files with variable resolutions are created from the same matrix. The final extension identifies the file type (.tif, .jpg, .pdf, .mpg, .mov, .flv, etc.). Each file name situates the object within the ecology of the archive and traces its origin to a media source outside the digital archive. Archival performance takes place also at the level of database organization and search algorithms as expressions of a classification system. Metadata will define the hierarchical and networked relations between items, determining the representation of the collections and the associative retrieval of items. Overlapping hierarchies and cross-relations establish the ontological representation of the archive as an aggregation of explicitly related and searchable items. Machine performance is dependent upon a category-building process that gives form and structure to a collection of items. We have made some effort to keep our system relatively flexible since we recognized the limitations of current taxonomies and systems of classification for forms of literature that are defined essentially by intermediality, and by the combination of literary and artistic genres, conventions, and techniques. As in the case of electronic literature (see [Tabbi 2007]), there is no set of agreed semantic operators for describing many of the works in this archive. Our taxonomy uses three overlapping systems of classification in an attempt to combine our own analysis of the corpus with the historical vocabulary of the practitioners (keywords) and also with standard Dublin Core descriptors. . 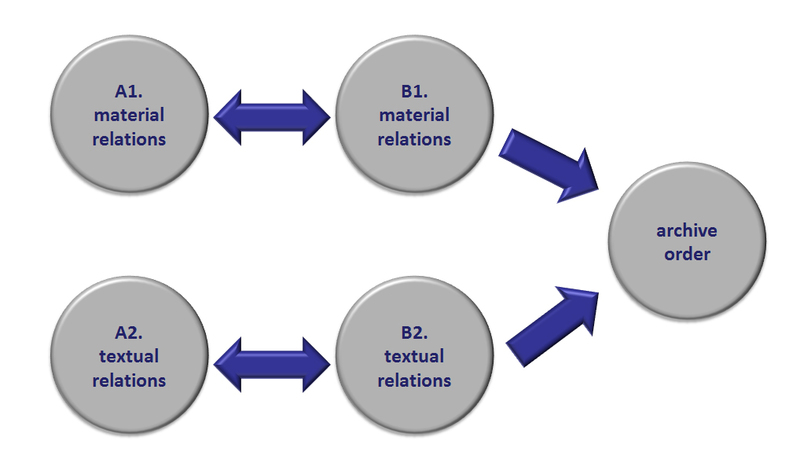 I highlight one particular aspect of the proposed taxonomy which is the interaction between the description of material, media, and technique (which we have called materialities) with the description of transtextual relations (which we have called metatextualities and paratextualities) [see Figures 19, 20 and 21]. We tried to strike a balance between two desirable aims: the need of bringing into the database structure some of the vocabulary and categories that reflect the original communities of practice, with their particular intentions and contexts; and the need to provide a critical and classificatory perspective that uses taxonomies validated by scientific and academic communities. Although the taxonomies have been generated through close observation of the specifics of the selected corpus, they were also subject to the requirements of higher-level descriptions that allow them to be interoperable with other databases ([Torres 2014]. Digital archiving as taxonomy: materialities (1) as the combined description of materials, media and techniques (digital, phonographic, performative, planographic, three-dimensional, videographic). 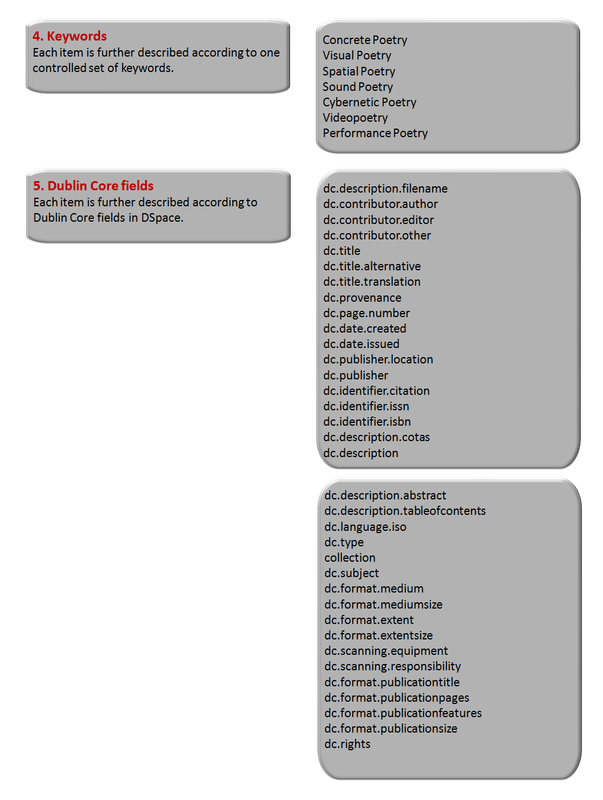 Digital archiving as taxonomy: keywords (4) as a set of tags based on categories defined by the original communities of practice; Dublin Core fields (5) as a series of standardized metadata descriptors. Finally the interface itself – including graphical design, navigation structure, and search capabilities – becomes another layer in the performance of the archive, producing certain kinds of display and modes of access to digital surrogates. Functionalities embedded in the interface establish a program of use, influencing users’ perception of the holdings and structure of the archive. Working as a frame of reference for the entire database, the interface co-performs the content for the user. At the same time, through an unanticipated choreography of interactions, which will evolve over time, the archive can re-imagine itself. Remediation is also occasion for re-imagination. An example of this re-imagination of the remediating dynamics is one strategy we have called “releitura” [“rereading”]. Here the digital facsimile approach has been substituted by a formal intervention that uses the original work as a program for further textual instantiations that can be developed through the use of code. Remediation becomes a creative translation that rewrites the text with scripts that explore its signifying potential within the new medium. Digital representation has become an occasion for a media translation that plays with the ratios of the various intersemiotic textual levels in the source works. In this anti-archival approach remediation is an open exploration of the signifying potential contained in visual and permutational texts. This form of reading as rewriting has been applied to a selection of paper-based works of the 1960s that have been treated as projects for new works ([Portela 2009]; [Torres 2012b]). One example can be seen in the “rereading” of the work Poemas Encontrados [“Found Poems”] (1964) by António Aragão. Two digital recreations of that work adopt different strategies, both of which stress the timed and temporal condition of writing in the periodical press. The randomized combination of printed headlines on the pages of periodicals is performed, in one case, by means of animation (using Actionscript code by Jared Tarbel) on a set of pre-defined words and phrases. Typographical differences in face, size, and style, as well as the progressive overlapping of white letters on black background, across different areas of the screen, emulate the indiscriminate collage of newspaper headlines in the original paper collage. Instead of digitally recreating the original typographic forms and phrases, what is recreated is the compositional and procedural principle of aleatoric combination. In the second instance, the Actionscript code by Tarbel works in conjunction with PHP programming by Nuno Ferreira, and with RSS feed in real time from online editions of several newspapers and sites – Público (Portugal), Jornal Folha de São Paulo (Brazil) , Google News Brazil , New York Times (U.S.A.), Jornal Folha de São Paulo (Brazil) - v. 2 , Jornal Expresso (Portugal) and Jornal La Vanguardia (Spain). The combinatorial collage of newspapers’ headlines has been applied to the current online press, using RSS tools and the language of web pages to build a mechanism for real-time digital collage – a device that is able to produce “found poems” through an algorithmic procedure. By displacing the particular historical content and historical reference of the original collage, this digital recoding de-contextualizes and breaks the chains of meaning that bind text and context, a move comparable to what happened in the original. Indeed, this is one of the main effects of the collage by António Aragão: original sentences and references have been abolished, or they remain only as a distant echo, since the poem has broken the markers of discursive cohesion and coherence that ensured their pragmatic function in the newspaper context. Its signifying emptiness, that is, its potential for meaning is embodied in the arbitrary network of relationships between words and sentence fragments, which continuously overlap and repeat in different scales and at various points of the screen, resembling statistical clouds of occurrences. The fetishist eroticism of detail is common to many digital archives that establish their authority on the basis of exhaustiveness in listing, describing, and marking details. Scholarly literary archives of autograph materials embody this contradiction between the desire for exhaustive markup of a never-ending set of material features and the resistance of textual instances to any fixed encoding system. This is one of the heuristic consequences of digital archives: our obsessive attempt to represent objects confronts us not just with what we don’t know, but also with the limits of knowledge as representation. Digital modeling seems to be, in this sense, a new way of experiencing the failure of representation. Inclusiveness, detailism, and exhaustiveness become ever-present and ever-unresolved issues. The medium’s simulatory affordances raise our awareness about the signifying potential of a whole new level of material differences. Once you begin to pay attention to all the minutiae of paper and ink, script and layout, cancellations and erasure, folds and cut-outs, preliminary and preparatory, software and hardware, materiality and textuality expand to all possible inscriptional variations. Writing acts assume a gestural and bodily dimension, as if read through an abstract expressionist code. Digital tools and environments show themselves as reading and interpretative devices rather than mere instrumental techniques for textual reproduction and simulation. The interpretative nature of editing and archiving as an intervention in the material instantiation of a specific textual field dispels empiricist illusions about the possibility of objective and definitive textual reconstitutions. Any digital representation will depend on the granularity of its description and on the politics of its constraints. The PO.EX Archive showed us the limits of our digital models for the artifacts that we were trying to preserve, classify, recreate, and network. These multiple transcodings performed the artifacts as particular products of the database aesthetics of knowledge production. This may well be one of the theoretical and methodological achievements of the current digital archiving obsession: editing and archiving can be critically used for acts of reinterpretation that fully engage the complexity of the various textual and media materialities of literary practices. Denaturalized and reframed by digital codes and forms, the dynamics between bibliographic, linguistic, spatial, visual, sonic, cinematic, and performative is rendered more explicit – a dynamics that can be programmatically used for reexamining the material production of meaning and for reimagining the archive itself as a representational intervention. Ultimately, the remediation of manuscripts, books, collages, photographs, audiotapes, videotapes, and programming codes as an intermedia network of digital objects gives us the opportunity for a reflexive exploration of the performative nature of digital simulation itself. Decentred and decontextualized by the technical affordances of the medium, digital surrogates enter a new space for material, textual, and conceptual experiments. This article contains a revised and remixed version of three unpublished papers: (a) “Digital Editing for Experimental Texts” (originally presented at “Texts Worth Editing”, The Seventh International Conference of the European Society for Textual Scholarship, 25-27 November 2010, Pisa and Florence, co-sponsored by Consiglio Nazionale delle Ricerche, Pisa, and Società Dantesca Italiana, Florence); (b) “PO.EX 70-80: The Electronic Multimodal Repository” (co-written with Rui Torres, and originally presented at “E-Poetry 2011: International Emerging Literatures, Media Arts & Digital Culture Festival”, State University of New York, Buffalo, 18-21 May 2011); and (c) “Performing the Digital Archive: Remediation, Emulation, Recreation” (originally presented at the Electronic Literature Organization conference “ELO 2012: Electrifying Literature: Affordances and Constraints”, West Virginia University, Morgantown, WV, 20-23 June, 2012). I want to express my gratitude to the organizers of those conferences, particularly to Andrea Bozzi and Peter Robinson, Loss Pequeño Glazier, and Sandy Baldwin. I also want to thank my colleague and friend Rui Torres for a three-year intellectual exchange about the problems of collecting, digitizing, editing, and recreating experimental works of literature. The final version has benefited from insights, comments, and suggestions by the anonymous reviewers of DHQ . This article is part of PO.EX: A Digital Archive of Portuguese Experimental Literature , a research project funded by FCT-Fundação para a Ciência e a Tecnologia and by FEDER and COMPETE of the European Union (Ref. PTDC/CLE-LLI/098270/2008). For a brief account of the evolution of experimental literary practices in the period 1960-1990 see [Torres 2012a]; for a detailed bibliography of experimental literary works see [Torres and Portela 2012]. Not all digitized materials will be made available. Most authors (or their executors) granted permission for including reproductions of their works, but we could not clear copyright authorization for all digitized items. One of the major sources for this project has been the Archive Fernando Aguiar . Fernando Aguiar, one of the authors of the group and organizer of several national and international exhibitions and festivals since the mid-1980s, has been collecting works and related documentation for more than three decades. 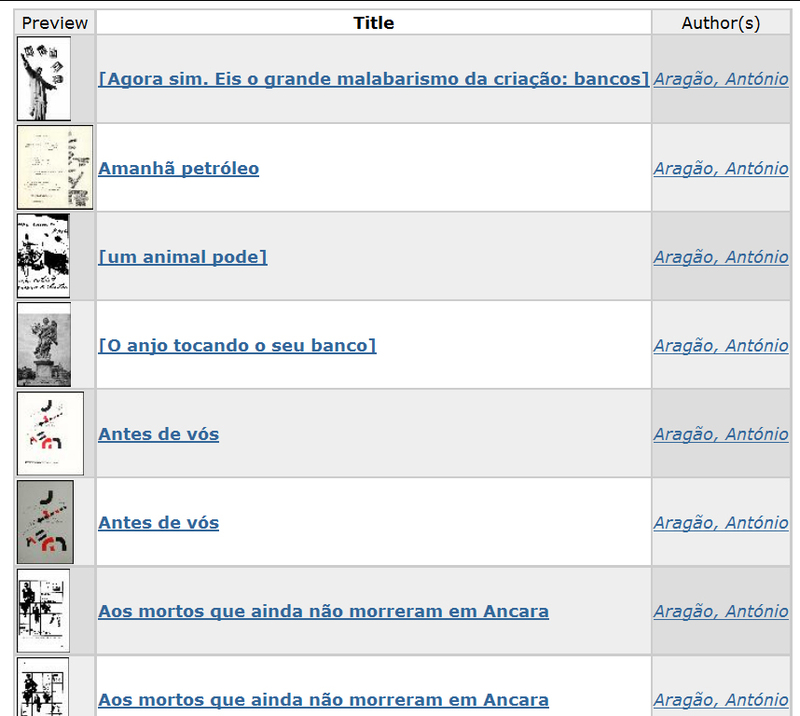 The PO.EX Digital Archive includes works by the following authors: Abílio [Abílio-José Santos] (1926-1992); Alberto Pimenta (1937-); Américo Rodrigues (1961-); Ana Hatherly (1929-); Antero de Alda (1961-); António Aragão (1921-2008); António Barros (1953-); António Dantas (1954-); António Nelos (1949-); Armando Macatrão (1957-); César Figueiredo (1954-); Emerenciano (1946-); E.M. de Melo e Castro (1932-); Fernando Aguiar (1956-); Gabriel Rui Silva (1956-); Jorge dos Reis (1971-); José-Alberto Marques (1939-); Liberto Cruz [Álvaro Neto ] (1935-); Pedro Barbosa (1948-); Salette Tavares (1922-1994); and Silvestre Pestana (1949-). Most printed texts (including manifestos, critical essays, and reception documents) are remediated as digital facsimiles in image formats. They are not transcribed as alphanumeric text. Although this option is justifiable because of the constellated and visual character of many works, it was also determined by our limited resources in time and money. Works and documents in standard typographic layout should also have been transcribed into digital text formats. This would enable complex queries in the textual body. One of the consequences of this limitation is that most of the critical dimension of the archive depends on the taxonomies used for associating metadata with each particular item. See, for instance, the Digital Formats Web Site (2004-2011), which is part of the National Digital Information Infrastructure and Preservation Program of the Library of Congress. In the domain of new media and internet art, see the research project and symposium Archiving the Avant Garde: Documenting and Preserving Digital/Media Art (2007, UC Berkeley). Archiving the Avant Garde is a consortium project of the University of California, Berkeley Art Museum, and Pacific Film Archive (with the Solomon R. Guggenheim Museum, Cleveland Performance Art Festival and Archive, Franklin Furnace Archive, and Rhizome.org). Their case studies include (1) computers and disks of authors such as Michael Joyce, Norman Mailer, Terrence McNally, and Arnold Wesker, housed at The Harry Ransom Center at The University of Texas at Austin; (2) computers and disks of Salman Rushdie held at The Emory University Libraries; and (3) hardware, software, and other collectible material from Deena Larsen, acquired by the Maryland Institute for Technology in the Humanities [Kirschenbaum 2009b]. Although not made in the context of a digital archive, similar approaches with random permutations can be seen in programmed versions of Samuel Beckett’s Lessness in Possible Lessnesses by Elizabeth Drew and Mads Haahr [Drew 2002] and Raymond Queneau’s Cent mille milliards de poèmes by Magnus Bodin [Bodin 1997]. Aguiar, Fernando, and Silvestre Pestana, eds. Poemografias: Perspectivas da Poesia Visual Portuguesa. Lisboa: Ulmeiro, 1985. Arms, Caroline R., Carl Fleischhauer and Jimi Jones, eds. Digital Formats Web Site. 2011. http://www.digitalpreservation.gov/formats/index.shtml. Bernstein, Charles. “Introduction”. In Charles Bernstein, ed., Close Listening: Poetry and the Performed Word. Oxford and New York: Oxford University Press, 1998. pp. 3-28. Bernstein, Charles. PennSound Manifesto. 2003. http://writing.upenn.edu/pennsound/manifesto.php. Bernstein, Charles. “Making Audio Visible: The Lessons of Visual Language for the Textualization of Sound”. Text 16 (2006), pp. 277-289. Bodin, Magnus. Cent Mille Milliards de Poèmes. 1997. http://x42.com/active/queneau.html. Burnard, Lou, Katherin O'Brien O'Keeffe and John Unsworth, eds. Electronic Textual Editing. New York: Modern Language Association, 2006. http://www.tei-c.org/About/Archive_new/ETE/Preview/. Deegan, Marilyn, and Kathryn Sutherland, eds. Text Editing, Print and the Digital World. Farnham: Ashgate, 2009. Drew, Elizabeth, and Mads Haahr. “Lessness: Randomness, Consciousness and Meaning ”. Presented at Consciousness Reframed: The 4th International CAiiA-STAR Research Conference, sponsored by (2002). http://www.random.org/lessness/paper/. Drucker, Johanna. The Conceptual Framework of Artists' Books Online. Artists’ Books Online. 2006. http://www.artistsbooksonline.org/mission.html. Drucker, Johanna, ed. Artists’ Books Online: An Online Repository of Facsimiles, Metadata, and Criticism. University of Virginia (2006-2009) and University of California-Los Angeles (2010-present), 2006. http://www.artistsbooksonline.org/. Drucker, Johanna. “Modeling Functionality: From Codex to e-Book”. In SpecLab: Digital Aesthetics and Projects in Speculative Computing. Chicago: University of Chicago Press, 2009. pp. 165-174. Filreis, Al, and Charles Bernstein, eds. PennSound. Center for Programs in Contemporary Writing, University of Pennsylvania, 2004-present. http://writing.upenn.edu/pennsound/. Goldsmith, Kenneth. About Ubu Web. UbuWeb. http://www.ubu.com/resources/index.html. Kirschenbaum, Matthew G., Erika L. Farr, Kari M. Kraus, Naomi Nelson, Catherine Stollar Peters, Gabriela Redwine and Doug Reside. 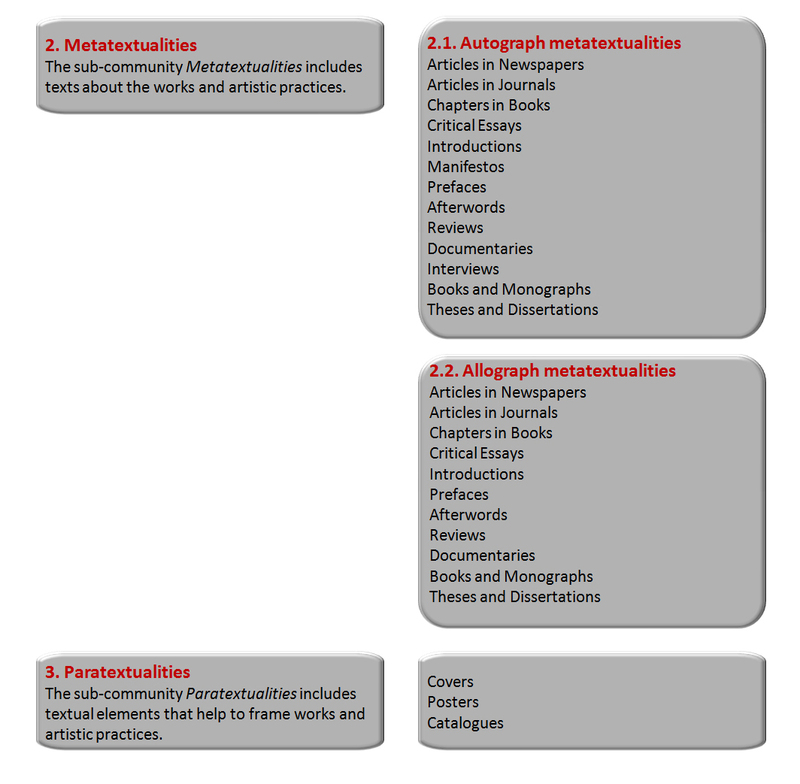 Approaches to Managing and Collecting Born-Digital Literary Materials for Scholarly Use. , White Paper to the NEH Office of Digital Humanities. 2009. http://drum.lib.umd.edu/handle/1903/9787. Kirschenbaum, Matthew G., Erika L. Farr, Kari M. Kraus, Naomi Nelson, Catherine Stollar Peters, Gabriela Redwine and Doug Reside. “Digital Materiality: Preserving Access to Computers as Complete Environments”. Presented at iPRES 2009: the Sixth International Conference on Preservation of Digital Objects, sponsored by California Digital Library, University of California (2009). http://escholarship.org/uc/item/7d3465vg. Liu, Alan, David Durand, Nick Montfort, Merrilee Proffitt, Liam R.E. Quinn, Jean-Hughes Réty and Noah Wardrip-Fruin. Born-Again Bits: A Framework for Migrating Electronic Literature. Electronic Literature Organization. 2005. http://www.eliterature.org/pad/bab.html. McGann, Jerome, ed. Rossetti Archive. Institute for Advanced Technology in the Humanities, University of Virginia, 1993. http://www.rossettiarchive.org/. McGann, Jerome. “The Rationale of Hypertext”. In Radiant Textuality: Literature after the World Wide Web. New York: Palgrave Macmillan, 2001. pp. 53-74. Montfort, Nick, and Noah Wardrip-Fruin. Acid-Free Bits: Recommendations for Long-Lasting Electronic Literature. Electronic Literature Organization . 2004. http://www.eliterature.org/pad/afb.html. Murray, Janet H. Inventing the Medium: Principles of Interaction Design as Cultural Practice. Cambridge: MIT Press, 2012. Portela, Manuel. “Flash Script Poex: A Recodificação Digital do Poema Experimental”. 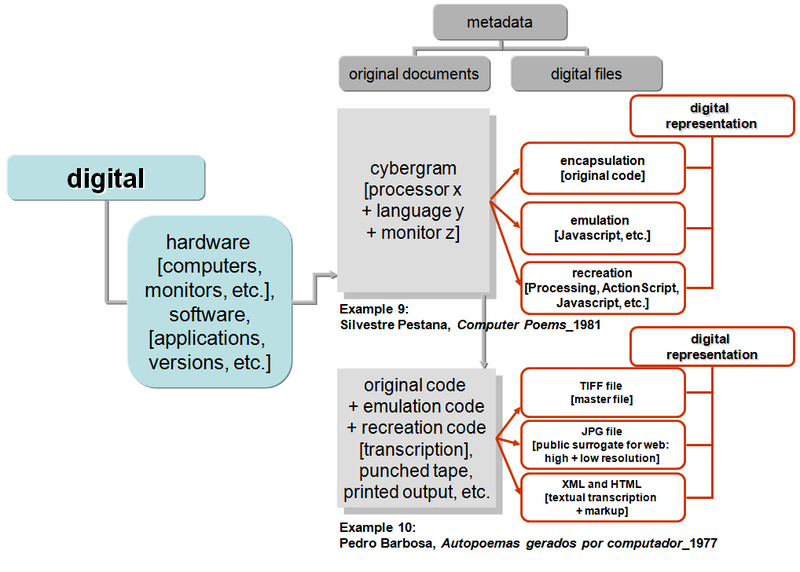 Cibertextualidades 3 (2009), pp. 43-57. Schreibman, Susan. “The Text Ported”. Literary and Linguistic Computing 17: 1 (2002), pp. 77-87. Schreibman, Susan, and Ray Siemens, eds. A Companion to Digital Literary Studies. Oxford: Blackwell, 2008. http://www.digitalhumanities.org/companion/DLS/. Shillingsburg, Peter. Scholarly Editing in the Computer Age. Ann Arbor: University of Michigan Press, 1996. Siemens, Ray. “Text Analysis and the Dynamic Edition? A Working Paper, Briefly Articulating Some Concerns with an Algorithmic Approach to the Electronic Scholarly Edition”. Text Technology 14 (2005), pp. 91-98. http://texttechnology.mcmaster.ca/pdf/vol14_1_09.pdf. Tabbi, Joseph. Toward a Semantic Literary Web: Setting a Direction for the Electronic Literature Organization's Directory. Electronic Literature Organization. 2007. http://eliterature.org/pad/slw.html. Torres, Rui, ed. PO.EX: Poesia Experimental Portuguesa: Cadernos e Catálogos. Porto: Universidade Fernando Pessoa, 2008. http://www.po-ex.net/evaluation/index.html. Torres, Rui. “Preservación y diseminación de la literatura electrónica: por un archivo digital de literatura experimental”. Arizona Journal of Hispanic Cultural Studies 14 (2010), pp. 281-298. Torres, Rui. “Visuality and Material Expressiveness in Portuguese Experimental Poetry”. Journal of Artists' Books 32 (2012), pp. 9-20. Torres, Rui. The dead must be killed once again: Plagiotropia as Critical Literary Practice. Electronic Book Review. 2012. http://www.electronicbookreview.com. Torres, Rui, ed. PO.EX: A Digital Archive of Portuguese Experimental Literature. Porto: Universidade Fernando Pessoa, 2013. http://www.po-ex.net/. Torres 2014 Torres, Rui, Manuel Portela, and Maria do Carmo Castelo Branco. “Justificação metodológica da taxonomia do Arquivo Digital da Literatura Experimental Portuguesa, ” Poesia Experimental Portuguesa: Contextos, Estudos, Entrevistas, Metodologias , Porto: Edições Universidade Fernando Pessoa [forthcoming]. Torres, Rui, and Manuel Portela. “A Bibliography of Portuguese Experimental Poetry”. Journal of Artists' Books 32 (2002), pp. 32-35. Van Hulle, Dirk, and Mark Nixon, eds. Samuel Beckett Digital Manuscript Project. Centre for Manuscript Genetics (University of Antwerp), the Beckett International Foundation (University of Reading), the Harry Ransom Humanities Research Center (Austin, Texas) and the Estate of Samuel Beckett, 2011-present. http://www.beckettarchive.org/. Vanhoutte, Edward. “An Introduction to the TEI and the TEI Consortium”. Literary and Linguistic Computing 19: 1 (2004), pp. 9-16. Werner, Marta L., ed. Radical Scatters: Emily Dickinson's Late Fragments and Related Texts, 1870-1886. The University of Michigan (1999-2007) and The University of Nebraska-Lincoln (2007-present)], 1999-present. http://archive.emilydickinson.org/radical_scatters.html.